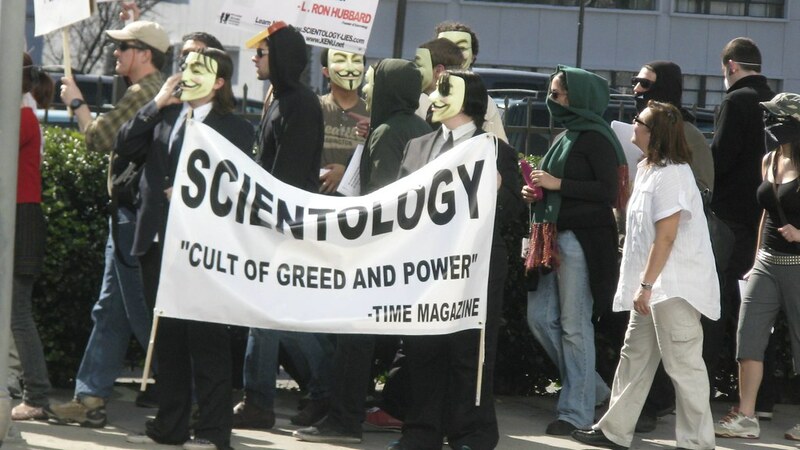 A group of hackers and activists simply called “Anonymous” have taken on the Church of Scientology. First they posted a video message to Scientology. Anonymous posted a follow-up video, calling for a global protest against Scientology on February 10th. Prior to the protests, Anonymous posted a video on “Code of Conduct”, detailing 22 very specific rules to follow during the protests. Rocketboom does a great job summarizing what lead up to the protests and they had several field correspondents who reported on the protests as they took place around the US and in London. Here’s GETV’s report on yesterday’s protest in front of Scientology in San Francisco. Brock over at SFist also has a write-up on the San Francisco protest. Over on Metroblogging Los Angeles Sean Bonner has a write-up on the Los Angeles protest, complete with a bunch of photos. Josh Poltilove of The Tampa Tribune reports on the protest at Scientology’s world headquarters in Clearwater, FL. Brian Braiker recently wrote about Anonymous’ war on Scientology for Newsweek “The Passion of Anonymous”. Anonymous’ recent actions were in party motivated by Church of Scientology’s attempts to force Gawker to remove a video they posted of Tom Cruise talking about Scientology. Along with the protests, Anonymous has recently launched Project Chanology, “a large scale plan to bring down the Church of Scientology in its present form”.